But I’m sure you would agree that what was once a marvel of modern machinery is now a mere fleck on the face of our subsequent achievements. The escalator has long been taken for granted; its once amazing triumph of getting us from one floor to another in a staggering, ooh, three quarters of the time, is now no more impressive than your dad wearing jeans. But I am not here to berate the great escalator, its modest mechanics still central to our day-to-day, despite its young, technological step-children popping up aplenty (escalator vs iPad: I think I know who’d win (crunch, crunch!)). I’m just somewhat puzzled by people who still treat them like spaceships. Who tentatively tickle the steps with their toes before taking the mighty plunge into the horror of a world where stairs move up and forward. It’s with these people that I have my beef. Have they not watched the rest of us? Did they not see that when we set foot on the crawling surface that it did not crumble, or speed up, or start racing backwards through space and time? Do they not have long enough while they stand, inching closer to the end, to prepare for a descent not too dissimilar to walking in a straight line? I’ve even seen people having problems on moving walkways – those long human conveyor belts which display you enticingly for those travelling in the opposite direction. Just get on it. You are not going to die (probably – read on). Incredibly there are announcements (and they’re not just for the blind; there are signs up too), that warn you you’re approaching the end. I just don’t understand. There’s no sign next to crossings pointing out the kerb. McDonald’s doesn’t come with a caution that it’s going to disappoint. There are just some things that everyone knows. How did these people slip through the net? You are also advised to face the direction of travel. What sort of imbecile needs this kind of instruction? You know which way to face when you’re walking. Why should this suddenly be thrown into doubt when on stairs? And why do these people get their own, special-case signage? What terrible traumas have these people witnessed to provoke such a fear of this old, faithful friend? Are they privy to something the rest of us aren’t? I needed to find out what was going on. Thank goodness for Wikipedia. Anyway, my favourite accident (yes, favourite) was when dozens of people were ‘thrown off an escalator that suddenly changed direction in a busy Beijing subway station’. Which got me thinking. Perhaps those who fear them are on to something. 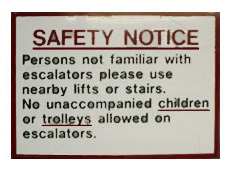 Perhaps the escalators will one day revolt, taking revenge on a technologically superior world. Maybe they’re waiting for the perfect moment when they can hurl a maximum number of us up into the air, our bodies breaking on ceilings, falling in fragments, iPad pieces pelting down all around. This entry was posted on Sunday, November 6th, 2011 at 12:56	and tagged with Coney Island, difficulty, don't like, escalator, evil machines, fear, iPad, moving walkways, people who can't use escalators, technology and posted in humor, J'aime pas. You can follow any responses to this entry through the RSS 2.0 feed. In all honesty I have more tolerance for awkward escalator takers than say those who get on one and proceed to charge up it as if they were being chased. If you want to walk, there’s another ingenious contraption called a flight of stairs. As a self affirmed lazy person who only has to look at a flight of stairs to feel breathless and sweaty, I would officially like to reclaim the escalator.